In 2006 , we recognised the need for somewhere that visitors could enjoy something in addition to the wines ? perticularly for the non-drinkers! Tea, coffee and tasty light snacks are now available from Easter through to September You will adore Lin's fresh, home-made scones, Bara Brith and her cups of tea too are reputed to be the best in Wales. In July, when school finishes and the summer holidays are full of promise, we hold a Pop Festival for the locals. This goes on from the Friday through Saturday, starting around noon and going on till midnight. Our 'little' festival has grown and now a line up of 12 bands, a beer tent and food vans to keep the visitors happy. 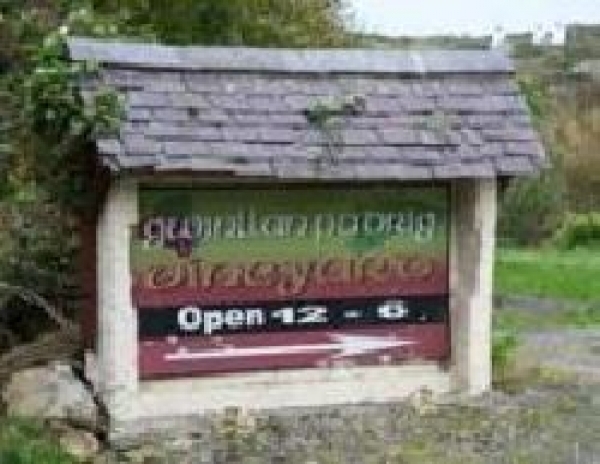 Camping overnight is permitted -it is handy after all the wine savouring - as you can be sure you won't have to drive. The facilities are basic and the scenery breathtaking. ...and you really must try our unique vinegar made from silver birch - both woody and sweet and incredible on salads. Near Menai Bridge - a sandy and rocky composition 0.8 miles away. Near Amlwch - a shingle and rocky composition 2.7 miles away. Near Menai Bridge - a shingle composition 3.2 miles away.